If you need to move water in a pond, whether it is for a fountain, waterfall or filter, you will need a pump. As all these functions require different pump characteristics it is necessary to have pumps with different characteristics. Submersible pond pumps are great for small ponds and first time pond owners. They can be used to power filters, fountains or waterfalls. We carry a full range of submersible pond pumps to meet a wide array of pond needs. Fountain Pumps need to be stable and must be able to operate efficiently for long periods without the need for regular maintenance. However they have to pump semi clean water to avoid blocking the fountain jet. Waterfall pumps need to be able to pump large volumes of water efficiently. This water however does not need to be free of solids. Filter Pumps need to be able to operate for long periods of time without blocking, they also need to be able to pass solids to the filter to enable them to be removed from the pond. As they are part of the life support system for the pond they need to be very reliable. To purchase a pond pump from our online store, either select a manufacturer from the menu above or type of pump from the list below. We carry pond pumps from the top manufacturers including Alita, Alpine, Atlantic, Aquascapes, Beckett, Cal Pumps, Crystal Pond, Eco Plus, Fishmate, Laguna, Leader, Little Giant, Matala, Pentair, Performance Pro, PondMaster, Savio, Scott, Sicce, Sti Aquatics, and Tetra. If you aren't sure which pump would be right for your pond, stop by our store or give us a call. We carry a full selection of submersible and in line pond pumps. We would be happy to assist you in making a selection before you buy online. Toll free 1-888-766-3725 or local Harford County Maryland calls 410-803-1688. We carry a variety of air and submersible pond pumps including Alita Air Pumps, Alita Submersible Pumps, Alpine, Atlantic, Aquascapes, Beckett, Cal Pond Pumps, Sequence Pumps, Eco Plus, Fishmate, Laguna Pond Pumps, Leader, Little Giant, Matala, Oase, Pentair, Performance Pro, PondMaster Pond Pumps, Savio Pond Pumps, Scott, Sicce Pumps, and more. 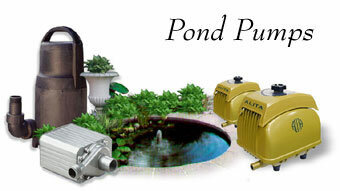 Come to Pond Pals Hemphill's Garden and Aquatic Center to purchase a pond pump by Laguna, PondMaster, or other leading manufacturer of pond supplies; Pond Pumps, Fountain Pump, Waterfall Pump, Filter Pump, Buy Pond Pumps Online.